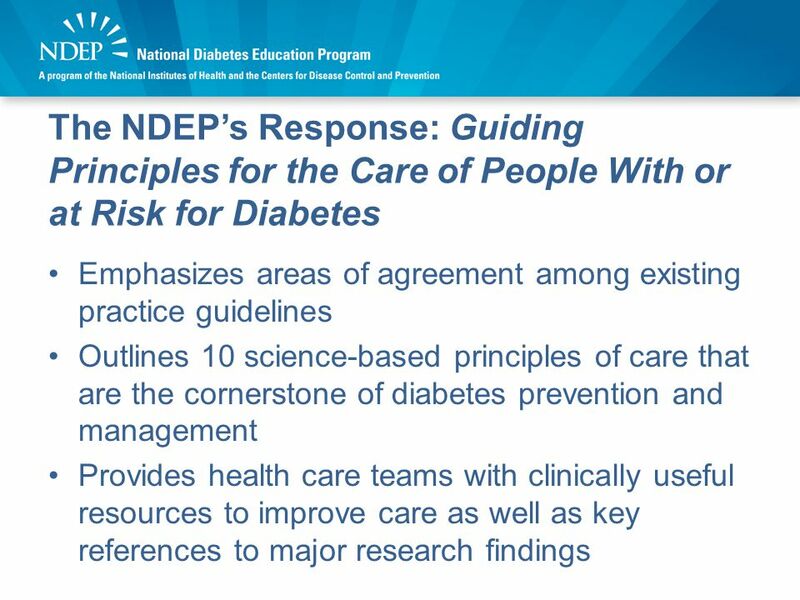 Guiding Principles for the Care of People With or at Risk for Diabetes www.YourDiabetesInfo.org/GuidingPrinciples. 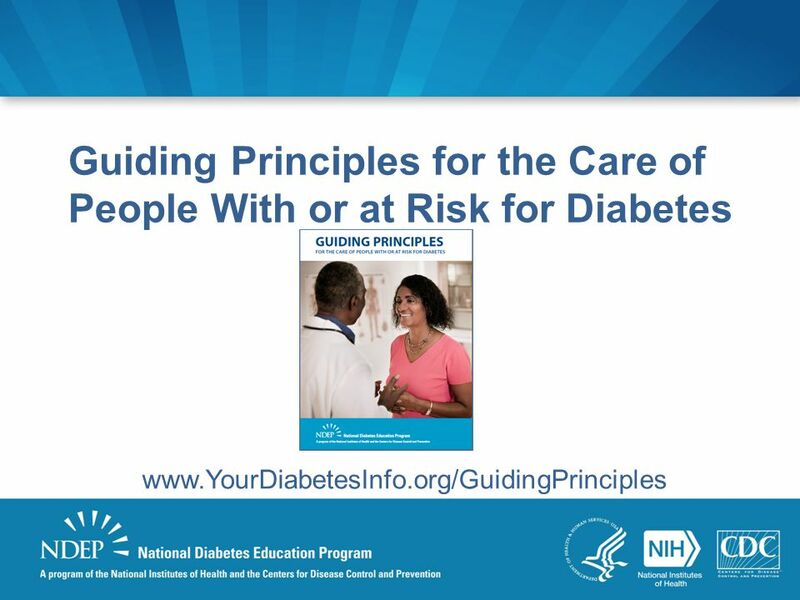 Download ppt "Guiding Principles for the Care of People With or at Risk for Diabetes www.YourDiabetesInfo.org/GuidingPrinciples." Investigating Gender Differences in HEDIS Measures Related to Heart Disease Ann F. Chou, PhD, MPH Carol S. Weisman, PhD Rosaly Correa-de-Araujo, MD, PhD. 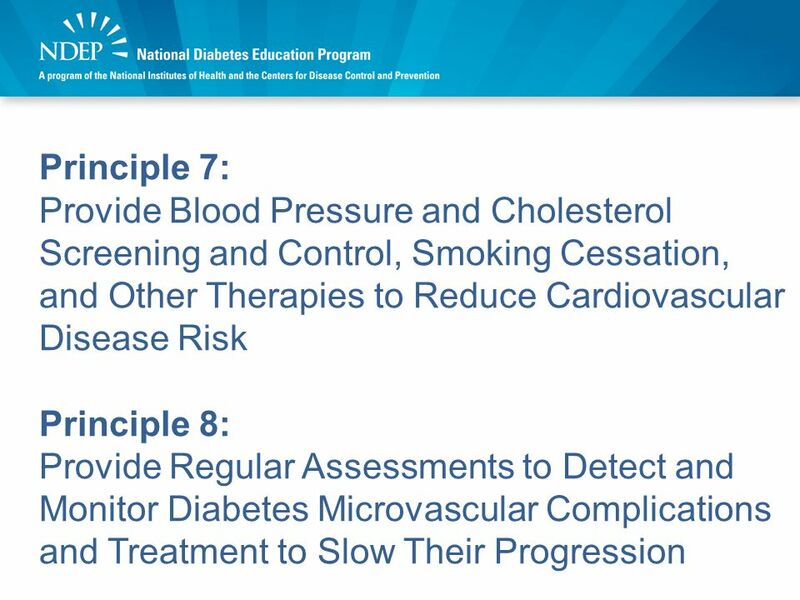 Performance Measures for Adults with Peripheral Artery Disease ACCF/AHA/ACR/SCAI/SIR/ SVM/SVN/SVS Performance Measures for Adults with Peripheral Artery. 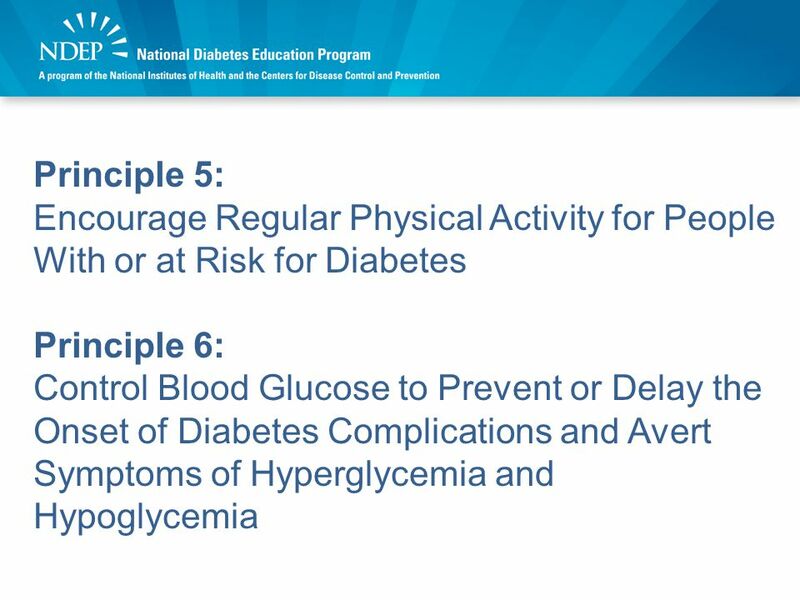 PREVENTION AND CARE OF DIABETES MELLITUS BY, DR. REKHA DUTT Associate professor, Department of PSM Padmashree DR. D.Y.Patil Medical College, Nerul,Navi. 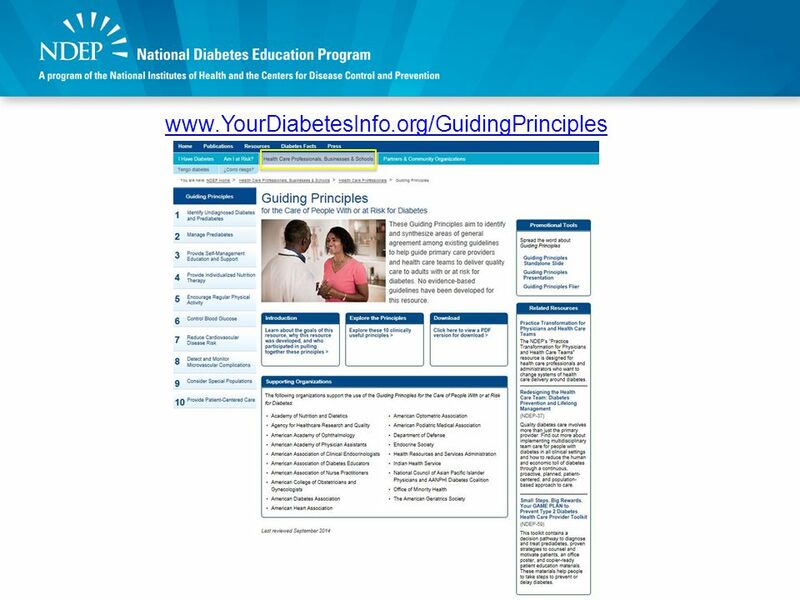 National Diabetes Education Program’s Helping the Student with Diabetes Succeed: A Guide for School Personnel Presentation Slides June 2013. 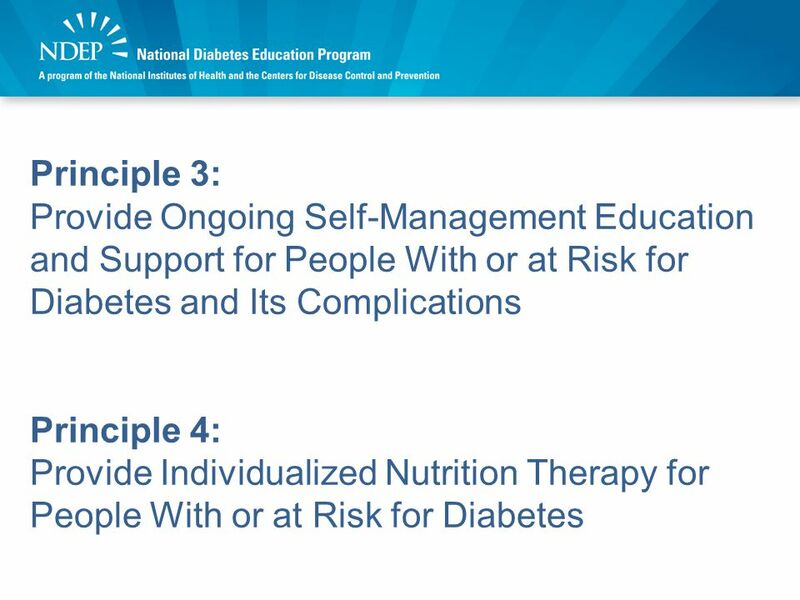 TitleDescriptionDurationTarget Audience Diabetes Diabetes Clinic (1:1) Nurse-led clinic focussing on managing your diabetes. 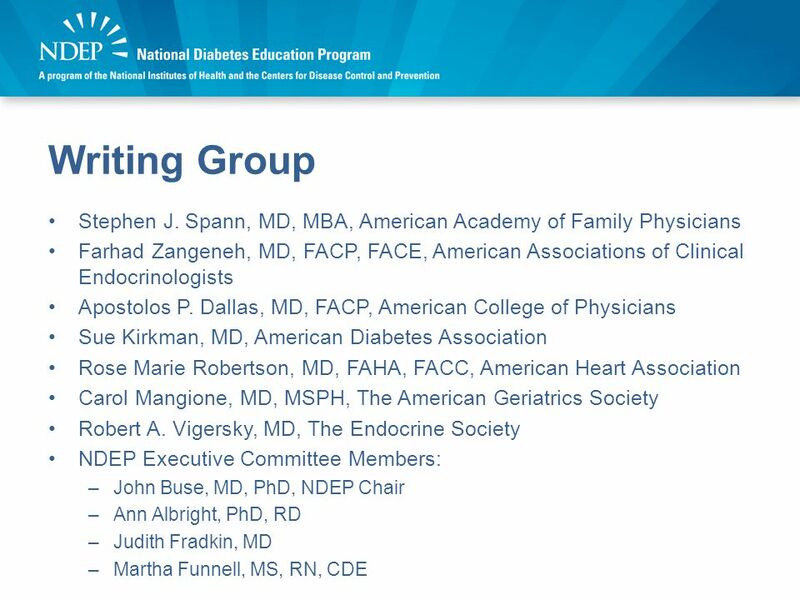 Pharmacist and dietitians. 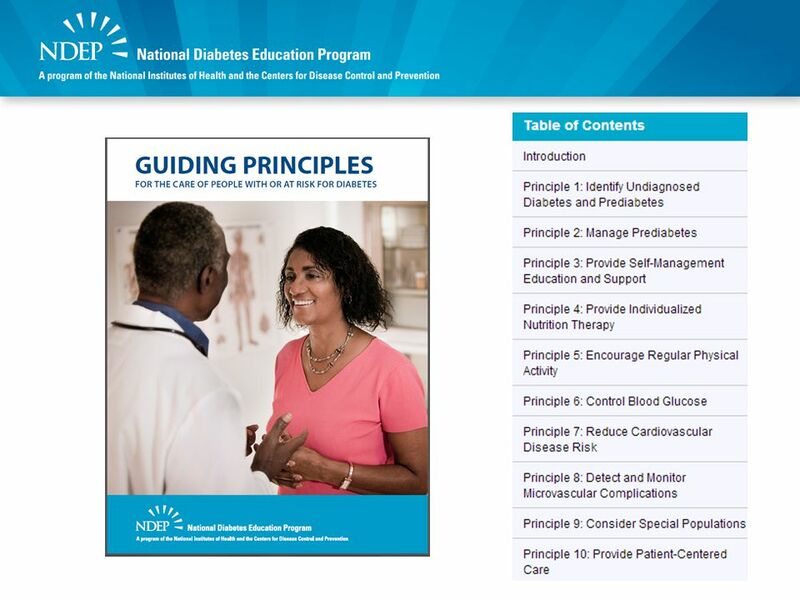 Sutter Medical Foundation Diabetes Management Program Kimberly Buss, MD, MPH Medical Director of Diabetes Education, SMF Medical Advisor of Diabetes. 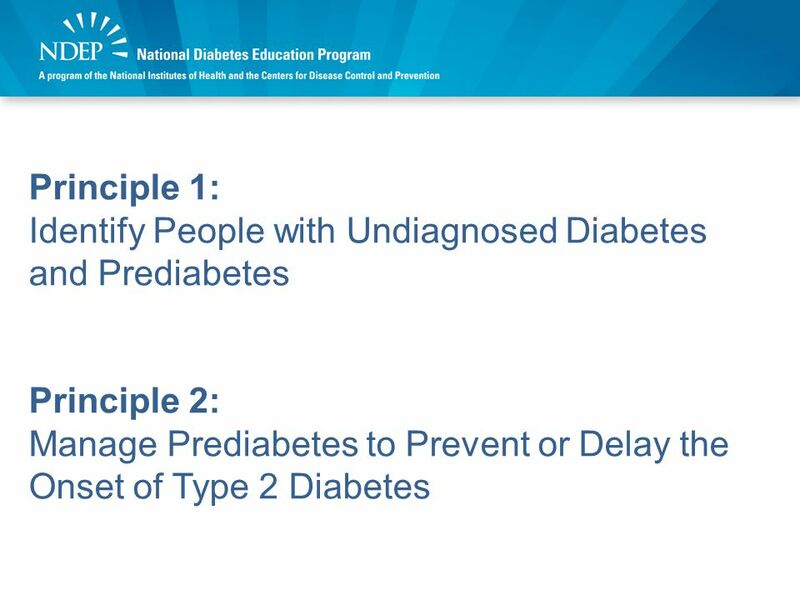 Produced by The Alfred Workforce Development Team on behalf of DHS Public Health - Diabetes Prevention and Management Initiative June 2005 Diabetes Prevention. 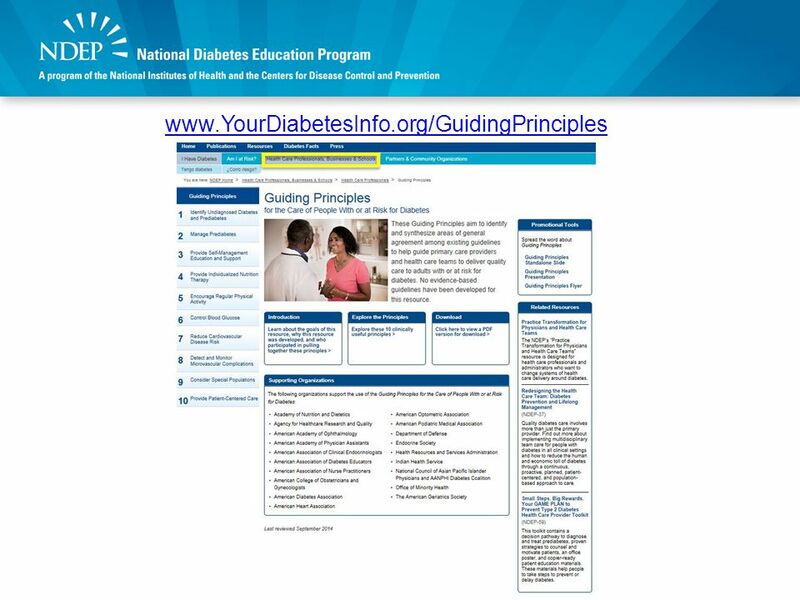 National Diabetes Statistics Report Fun Facts on Diabetes 29.1 million people or 9.3% of the US population have diabetes. Diagnose : 21.0 million people. Healthy Purdue Stacey L. Mobley, PhD, RD, CNSD Assistant Professor Department of Foods and Nutrition A Platform for Research in Disease Prevention and. 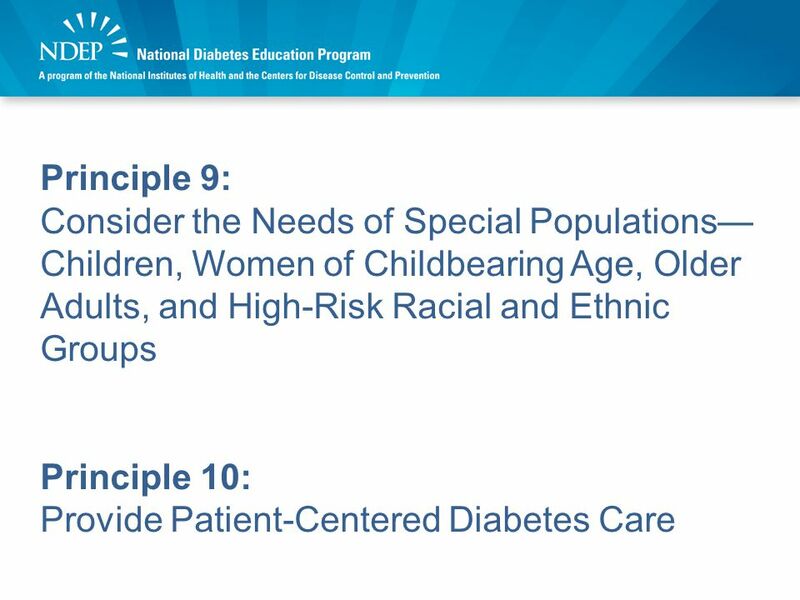 Stanford GEC Copyright © 2005 Mental Health Aspects of Diabetes in Elders from Diverse Ethnic Backgrounds Prepared by: Jill LeCount, RN, MS, CNS Based. 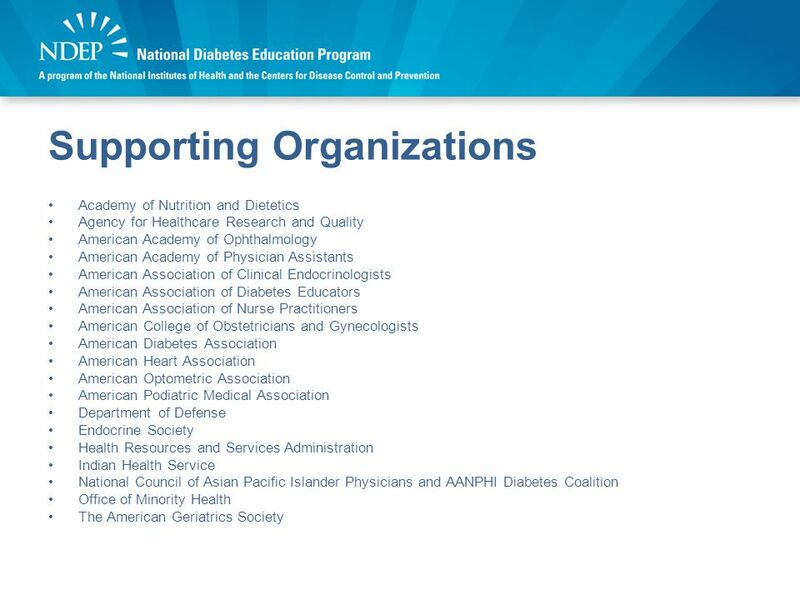 SM Diabetes 101: A Brief Overview M. Sue Kirkman, MD American Diabetes Association Senior Vice President, Medical Affairs and Community Support Acting. 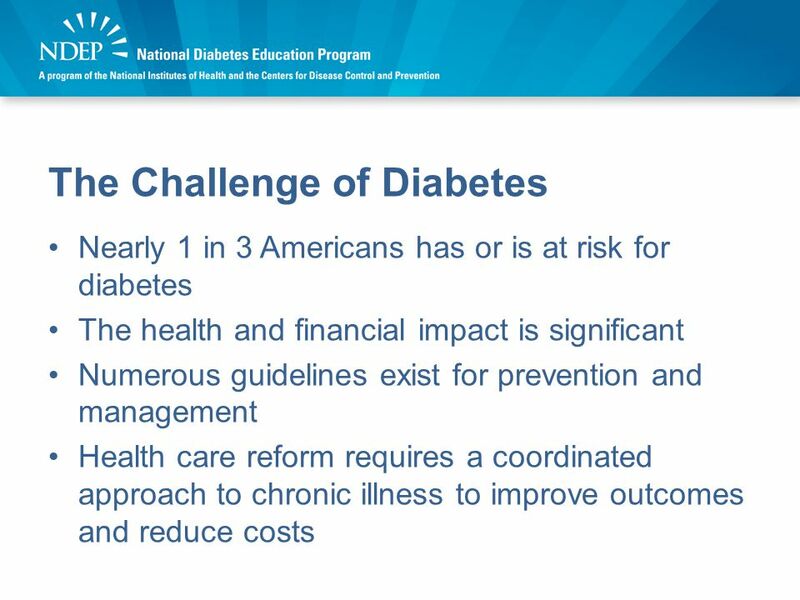 Diabetes: The Numbers Michigan Diabetes Partners in Action and Michigan Department of Community Health Diabetes: The Numbers Adapted from the National. FCS Program Focus Area – Healthy Eating/Active Lifestyles Dr. Virginie Zoumenou UMES/ Maryland Cooperative Extension 11/01/07. 1 Maternal Mortality Review Team Virginia Department of Health Office of the Chief Medical Examiner Victoria M. Kavanaugh, RN, PhD Coordinator. 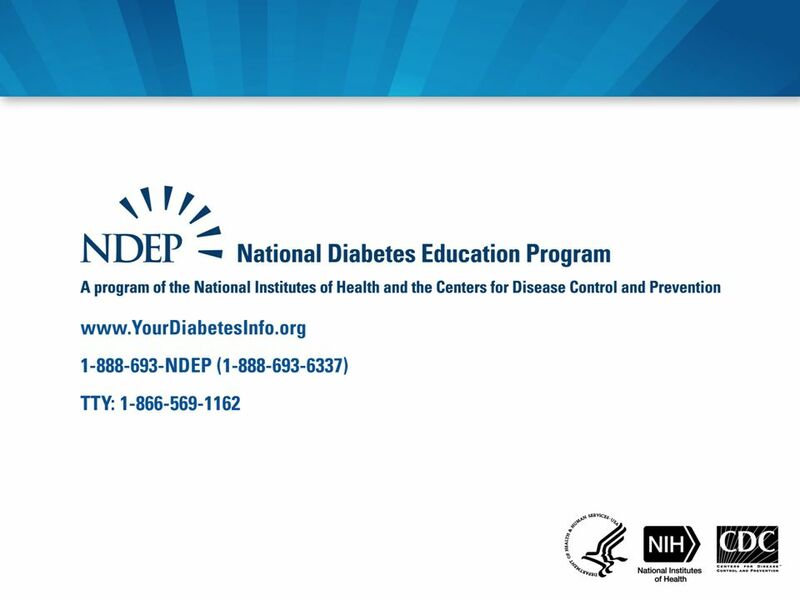 National Diabetes Education Program www.YourDiabetesInfo.org 1-888-693-NDEP (1-888-693-6337) A joint program of NIH and CDC Diabetes: The Numbers Revised.